Feisal’s apparent concession to the Jews, i.e., seeing them develop a separate political entity all their own in Palestine, may have been a case of wishful thinking on the part of the Jews. Weizmann’s hackles should have been raised, warning him intuitively that he risked being had when the entire document was written in English and Feisel knew no English (T.E. Lawrence was interpreter). 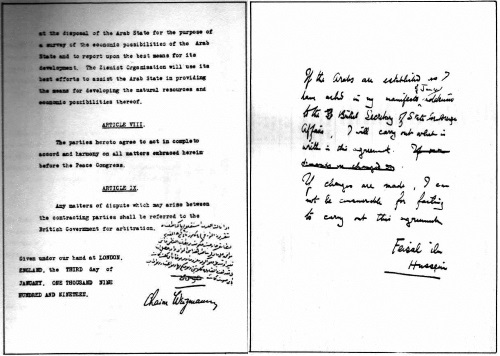 Did Weizmann not ask himself why Feisal did not want the agreement to be written up and signed in his own language as well? This post was first published on Israel Diaries. Sheri Oz is a retired psychotherapist living in Israel for 38 years. Always interested in politics and international affairs, she now has time to study and write about it to her heart’s satisfaction. She often writes on her own site, Israel Diaries. Previous Islamic Jihadist attacks: How Deadly? Next Into the Fray: Folly at the Forum. Regardless of Feisal’s sincerity or otherwise, the Agreement is an excellent indication of what could have been… There is also good cause to believe that there were many, in fact hundreds of local Arab sheiks who opposed the Mufti of Jerusalem and wanted to welcome Zionist immigration. And, as The article points out, the Agreement also evidences the good intentions of the Zionist movement. Thus we should continue to remind the world about this Agreement. It’s in the interests of truth, justice and peace to do so. Well, yes and no. Feisal was playing all sides of the fence, which he had every right to do. He was dealing with the Ottoman Empire at the same time he was dealing with the British. And, according to some, the Feisal administration in Iraq was a bit of a golden age for Iraqi Jews, schools flourished, Jews (being more literate) entered the British style civil service in droves, the country has a Jewish Finance minister, which came to an end when his son Ghazi ascended the throne in 1933. Not really Ghazi’s fault – he left governing to his ministers and preferred the high life. If one wants to assess Feisal’s intentions one has to consider his actions in Iraq. I’ve also never come across an analysis comparing Abdullah and Feisal’s rule in English, which is strange because, given that they were brothers, it’s the most natural and obvious thing to do. I’d hope it’s a standard question in high schools in both countries. “A clerical error by the British Colonial Secretary Malcolm MacDonald, that was intended to be seen only by the Arab delegates, arrived at the office of Dr. Wiseman. In the letter, MacDonald promised severe limits on Jewish immigration, and no Jewish national home without Arab consent.” – (The conference, London St. James Palace; Rafael Medoff/JNS.org).